Only birth can conquer death—the birth, not of the old thing again, but of something new. Only birth can conquer death—the birth, not of the old thing again, but of something new. Within the soul, within the body social, there must be—if we are to experience long survival—a continuous “recurrence of birth” (palingenesia) to nullify the unremitting recurrences of death. This seminal work has influenced millions of readers since it was originally published in 1949, bringing the insights of modern psychology together with Campbell's revolutionary understanding of comparative mythology. 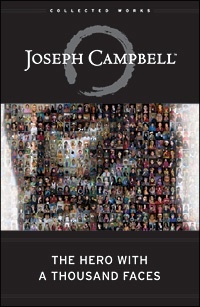 In The Hero with a Thousand Faces, Campbell formulated the dual schemas of the Hero's Journey, a universal motif of adventure and transformation that runs through all of humanity's mythic traditions, and of the Cosmogonic Cycle, the stories of world-creation and -dissolution that have marked cultures around the world and across the centuries. Translated into over twenty languages, The Hero with a Thousand Faces has sold well over a million copies and continues to find new audiences among professors and students in fields ranging from the history of religion and anthropology to literature and film studies; among creative artists including authors, filmmakers, game designers and song writers; and among all of those interested in the basic human impulse to tell stories.